The Sahar police in Gujarat, India filed a charge sheet against 16 people accusing them of human trafficking. This group was busted in 2017 during an operation of illegal immigration to Canada. The group was accused in the help of the illegal enter North America. And year after this situation, the Sahar police finally filed a charge against those 16 people. The group is charged with trafficking 52 people from Gujarat to Canada between 2015-2017. Their illegal activity was based on using forged documents for illegal entry to Canada. The racket was busted in 2017 when one of the victims, Komal Dabgar, was deported from Canada after the authorities found that her passport was fake. The gang, according to Hindustan Times, made at least Rs 26.5 crore — charging Rs 50 lakh per trafficked person on an average — in two years. 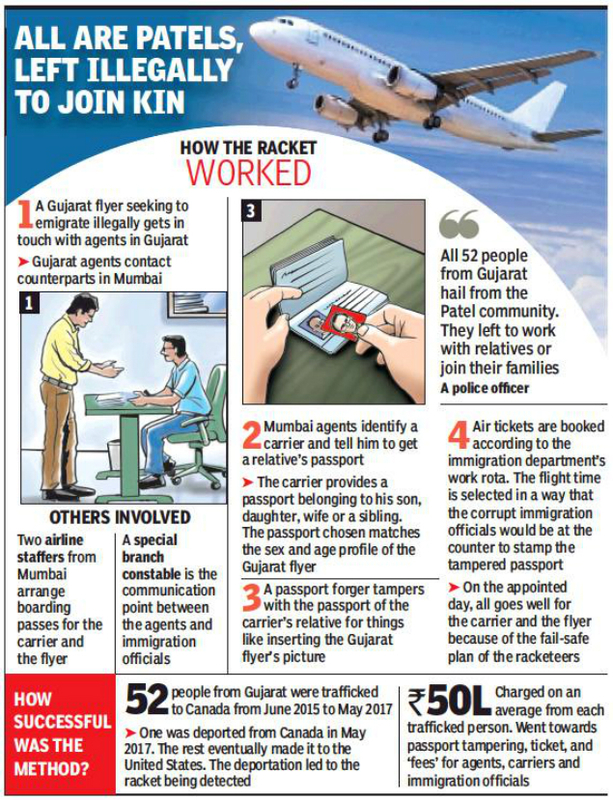 According to the charge sheet, 5 immigration officers at Mumbai airport were key to the trafficking but their names have not figured in the charge sheet yet as the police are waiting for the approval of the Union government. According to government data, almost 20,000 women and children were victims of human trafficking in India in 2016 and this number is rising every year. The number 20,000 is in fact a rise of nearly 25 percent compared to 2015. The statistics of the Ministry of Women and Child Development states that 19,223 women and children were trafficked in 2016 against 15,448 in 2015, with the highest number of victims being recorded in the eastern state of West Bengal. The problem of human trafficking is one of the biggest challenges today for officials of India. According to Anti-Slavery International and the US Department of State’s 2005 Trafficking in Persons Report, there are approximately 27 million people worldwide presently enslaved: 80 percent are women and 50 percent are children. It’s quickly becoming a well-hidden organized crime in Canada. The war against traffickers today is one of the most complicated tasks for immigration and customs officials of any country. As criminals adapt to new technology, so must international law enforcement and investigation agencies. Offered by Brainwave Science, iCognative is a unique technology that supports law enforcement distinguish between traffickers and innocents by the power of brainwaves. By measuring and recording brainwaves, iCognative can find out if the person knows confidential information about the particular crime. For example, in the given situation regarding 16 people accused in human trafficking, the technology can help law enforcement agents determine the involvement of every suspect in this crime. Important case related investigation details including data such as: dates of contacts made with each person; pictures of fake documents created for clients; financial methods use to receive or send funds; names and designations of customs and law enforcement officials working as agents for the gang; locations and names of people in Canada designated to harbor trafficked individuals, etc., along with other details so far not available in public domain can be used as Stimuli to conduct a iCognative test. Within 45 minutes of presentation of this Stimuli on a screen virtually infallible, system driven iCognative system shall deliver with over 99% accuracy definitive results to help proceed the case in right direction. Deployment of iCognative technology by Brainwave Science is the best approach insensitive as well as complex cases of human trafficking that may very well be a part of a huge organized crime ring. Additionally, iCognative respects the privacy of the suspect and supports human rights. One of its main advantages being its applicability in more than 85% of cases. Easy to use and easily learned iCognative doesn’t need any specific knowledge or education, any computer literate investigator can use this technology in a matter of day or two. iCognative by Brainwave Science accelerates investigation in trafficking cases for expeditious delivery of justice to victims. iCognative can be the main ‘weapon’ in the war against human trafficking, it provides investigators an opportunity to be one step ahead of traffickers.